All students all over the world dream to have regular substantial meals at least 3 or better 4 times a day. However, having a quick snack during the recess is the only possible option. My boyfriend Vlad and I are not the exception. After the university classes we have to go to work. And besides having lunch, you always feel hungry and try to find something to eat. We used to buy different fast food, chocolates, buns, but very soon such snacks turned into awful feeling in a stomach, heartburn. I was lucky to have a friend in my group, who ate the cedar bars during recess. As far as you understand the next day I already had this cedar bar. There are 4 of them: Cedar Honey Bars: “Energy” with cedar nuts, “Good Mood” with chocolate taste and cedar nuts, “Youth” with almond and sesame, “Immunity” with cranberry and raspberries. As I am a great lover of chocolate I bought 4 chocolate cedar bars. 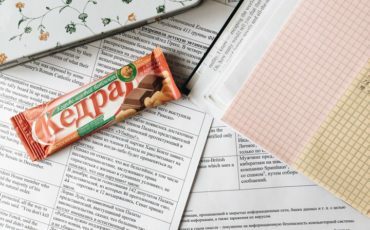 That day I had 4 classes from 9 am to 4 pm and during every recess I had a bite with chocolate cedar bars. I wasn’t hungry at all that day! One big advantage of this chocolate cedar bar that it isn’t only very nourishing, tasty, but also contains minimal amount of calories. I found the best snack and of course I will try other tastes of cedar bars.